Several years ago I became aware of a new energy about me. Within days, I was encouraged to request a name and purpose and was instantly rewarded. This ancient being of light is a dear and cherished teacher, friend, guide and guardian of the crystal realms. She asked for permission to enter into and join my primary circle of spiritual counselors. My first conscious memory of her, in this time, came during a meditation in Scottsdale, Arizona. The year was 1972 and I was being guided through massive crystalline caves into a classroom where some 30 others were gathered, as was I.
was based upon the degree of depth, understanding and wisdom individually desired. My 'professor' so to speak, was and is a beautiful shimmering crystalline being not unlike ourselves in body yet with an amazing radiance of light and color emanating throughout her entire form. Kriss-Tar is a planetary being, a bridge from this world to those of the ancient realms. Her commitment is to provide a pathway of light to those of the Crystalline, Faerie, Angelic, Rainbow worlds, the star system of Sirius and yes, beyond. She came to talk with the children of these realms. Some are, those of us, the early ones that came in years ago to set the way. Many are the children of now... their light so brilliant, yet often unable to be fully present. their personalities, desires and spirit. Essence of Light products are created to support personal growth, change and self-healing. All of the product formulas have evolved from the workings of the counsel and myself. This includes Kriss-Tars knowledge and wisdom. 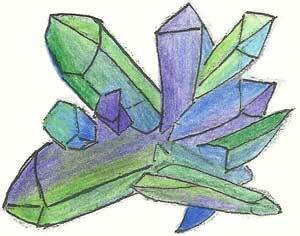 In essence, she is the group specialist on stones and crystals. Her understanding of our body chemistry and human crystalline structures is astonishing. Over time, I have continued to channel in a similar manner yet the information coming through contains more depth, range and content as the 'group' and Kriss-Tar provide new octaves of inspiration, clarity, detail and guidance for each client. Most certainly Archangels Michael and Raphael are always present as are ancient masters, healers, those of the angelic and faerie realms, my higher self and those beings of my client. Their individual voices are clearly heard and shared as desired. As this year evolves we continue to have even more opportunities to explore the gifts of gratitude, appreciation, self acceptance, hope, passion and yes even abandonment. In addition, our own crystalline bodies and early base frequencies are not only re-emerging, they are approaching a level of being sublime. What does this mean... the term unlimited has more potential. We can attempt to stand still or we can embrace our power giving birth to a depth of desire, enthusiasm and accomplishment untold. We have the freedom to choose... it was always so, only now we know we can. Or we may be standing upon that point awaiting more clarity prior to fully accepting our personal truths and power. Where ever you are Kriss-Tar is available to assist you, with your higher consciousness, to move beyond your present boundaries into a new realm of knowledge and wisdom. A new line of Faerie Remedies are especially powerful in ushering in, developing and utilizing all the above energies. These joyous elixirs of life are also effective in harmonizing issues of 'the children' both young and older. There are guides specific to each of you that await your invitation to more clearly enter into you waking state. This may be an angel, ancient grandfather or grandmother, master, personal counselor or one such as Kriss-Tar from a long ago past origin. These beings are not my group but rather one you have called forth, from a higher plane, to meet with at this time and in this space. Initially there is a connection providing the awareness of their presence. It is then possible to become friends and a companion assisting you in very real and practical ways each and every day. For others your preference may be more in accordance with what you are presently 'lining up' in your reality. Your session may also encompass a bit of both with additional attention to goals, personal issues of growth, change and how to accomplish such changes with elegance and ease. We also work very powerfully with the needs of the Rainbow children. For the younger ones and teens this can be done via the parent. A session can provide guidance as to the child's needs with insights into balancing their energy fields. The group assists many dealing with personality and non adaptive disorders. This can be done at an energetic and vibrational level allowing the body to re-align with its natural imprint and self correct. download directly to your computer or mp3 player.